Why? Could it be that the Catholic Faith, also in flames, is nevertheless still something modern men instinctively know the world cannot live without, even though so many have abandoned it? 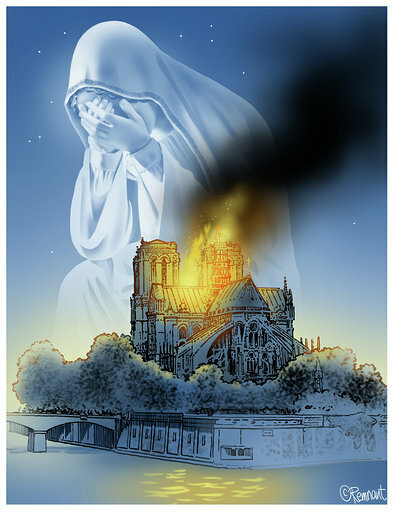 If Notre Dame in flames was a metaphor for the modern Church in flames, is the promise to rebuild not also a metaphor for what's to come, as the Novus Ordo breathes its last? After all, the 'butcher block' table altar at Notre Dame was crushed beneath the weight of the falling spire, while the old high altar stood virtually untouched. If you’re looking for a sign, look no further. Notre Dame still stands today as she's stood for nearly a thousand years. And as long as she continues to stand with her glorious angels, craggy old gargoyles and magnificent flying buttresses there to remind the world of what we once were and what we can become again if we turn back to God — there’s hope.